Foraging toys are an essential part of your bird's daily routine. Remember... Busy minds make Happy birds! Drilled Wood Block 1.75" x 1.50" x 6"
Great as a base for smaller toys or foot toys. Stuff with Nutri-Berries and make it a foraging toy! Drilled Wood Block 1.75" x 1.50" x 8"
Hide treats such as small nuts inside. Toss into your bird's food dish for a foraging frenzy! Or... use as a part for a masterpiece toy. 3/4" wide. Price is for 15. 3/4" wide. Price is for one. A #1 Seller! This toy is chock full of fun textures, including finger traps, loofah,crinkle paper, jute sticks, wood spools, palm chain, corn husks - all hung with stainless steel wire! Make this a foraging toy by hiding your bird's favorite treats inside! Hours of fun! Appropriate for small to medium birds, such as conures, pionus, caiques, greys, eclectus, galahs and similarly sized birds. Measures: 10"L (total hanging) x 4 1/2"W.
The Double Dipper has a lot to offer! A large birdie bagel houses colorful wooden slats of different shapes and sizes. The foraging cups on the sides provide lots of foraging fun! Stuff with Nutriberries, Nuts, even some Natural Toy Parts for hours of foraging play. Recommended for medium to large birds such as Greys, Eclectus, Hahns Macaws, Cockatoos and other similarly sized birds. HUGE! Recommended for larger birds or medium birds who go for the gusto! What's not to like about this one? Bagels, balls, plastic toy parts... huge foraging opportunities.. all strung on bird-safe poly rope with a huge bird safe link for hanging. This toy weights 1 1/2 pounds! Sure to be a winner! Be sure to click the picture to enlarge it so that you can enjoy the full view of this toy! Measures: 19"L (total hanging) x 14"W x 3 1/2" D.
Birds need natural toys to pick, chew, shred, and forage to condition their beaks and satisfy their instincts. Lots of enricment here with this new coconut shell made into the shape of Parrot's head!! Make it a foraging toy and stuff some non-perishable treats in the parrot's mouth. The mouth comes with cuttlebone and wood blocks to chew. Recommended for medium birds to less agressive larger birds. 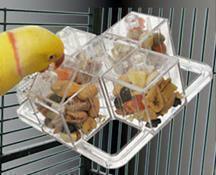 Made of durable Polycarbonate, the Food Tumbler requires your bird to spin it to get the treats out. Trick is, you can adjust the level of difficulty by moving the food tube further in or out of the toy. Let the foraging fun begin! It's all about the treats and fun and the foraging! Great for beginners in foraging or for birds who are less accepting of larger foraging toys. Recommended for small birds like Conures, Caiques, Hahns Macaws, Quakers, Ringnecks, Pionus and similarly sized birds to less agressive medium birds. It's all about the treats and fun and the foraging! Three different compartments from which to choose! It doesn't get much better than this. Made for small birds like Conures, Caiques, Hahns Macaws, Quakers, Ringnecks, Pionus and similarly sized birds to less agressive medium birds. Made with the little guys in mind! 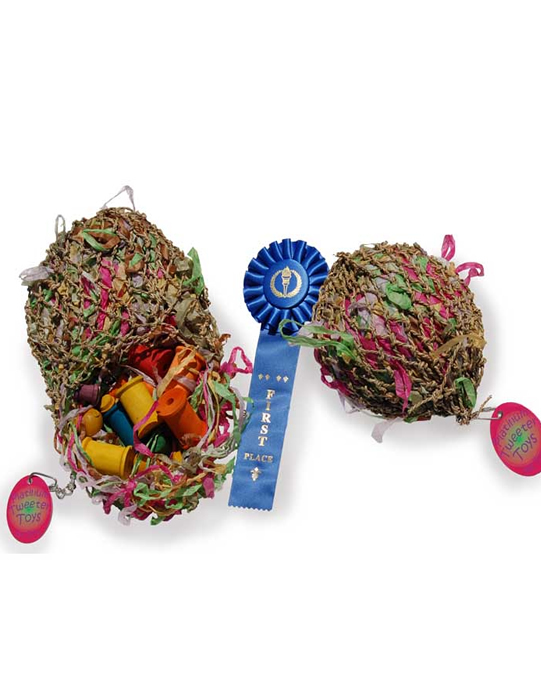 A cluster of three shreddable party balls, each stuffed with ribbon to pull out. Each are 2" in diameter and strung on 6" sisal rope. Can be re-stuffed with non-perishable treats or crinkle paper. Great for foraging! Recommended for small birds, from cockatiels, lovebirds and budgies to caiques, conures, ringnecs, quakers and similarly sized birds. Great for the little guys! The party never stops with this hollowed out shreddable party ball. 4" in diameter and strung on 6" sisal rope. Stuff with non-perishable treats or crinkle paper. Great for foraging! Made with the little guys in mind but fine for the medium guys, too! A cluster of three shreddable party balls, each ready to be stuffed with foraging items to pull out. Each are 4" in diameter and strung on 6" sisal rope. Can be stuffed with non-perishable treats or crinkle paper. Great for foraging! Recommended for small birds, from caiques, conures, ringnecks, quakers to greys, eclectus, goffins and similarly sized birds.